New York, NY, April 9, 2014 – HDtracks, the leader and pioneer in high resolution audio digital downloads, today announced a 20% increase in sales for Q1 2014 over the same time last year. This continuing trend reflects the growing demand for better quality digital music downloads. 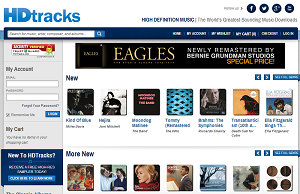 Notably, consumer demand for the better sounding music downloads available at HDtracks spans a broad range of music categories and genres, with sales increases seen throughout the label’s growing roster of both classic jazz, rock and contemporary pop albums – all available via DRM-free CD and DVD-Audio quality downloads at the highest possible bit/sampling rates. Since the launch of HDtracks in 2008, the company’s business has seen significant growth each year, a success that mirrors the explosive, double-digit growth of high-resolution digital downloads overall. HDtracks.com is the leading high resolution digital download company in the world. Founded in 2008 by three-time Grammy nominee and highly respected record producer and musician, David Chesky, and his brother Norman, HDtracks saw the possibility for a future model of high resolution audio digital downloads years before the demise of the major brick and mortar music stores. Chesky has been at the forefront of audio technology, having created the world’s first 24-bit/96kHz recordings, 6.0 multichannel 24-bit/192kHz DVD-Audio Disc layout, 128x oversampled recordings, and Binuaral+ for 3D sound playback on both loudspeakers and headphones. Follow HDtracks.com on twitter @hdtracks and Facebook: HDtracks or visit us at HDtracks.com.